Ezequiel González-Ocantos is Associate Professor in the Department of Politics and International Relations at the University of Oxford, and a Professorial Fellow of Nuffield College. His book Shifting Legal Visions: Judicial Change and Human Rights Trials in Latin America (Cambridge University Press, 2016) won best book awards from the American Political Science Association, International Studies Association, and Latin American Studies Association. His work has also been published in Comparative Politics, American Journal of Political Science, and Comparative Political Studies, among other journals. Chad Kiewiet de Jonge is Affiliated Professor in the Political Studies Division at the Centro de Investigación y Docencia Económicas (CIDE) in Mexico City. His research agenda includes a large-scale study of clientelism and electoral intimidation in Latin America, a project examining the development of democratic attitudes in new democracies, and ongoing research on electoral behavior in the Americas. His research has appeared or is forthcoming in American Journal of Political Science, Political Behavior, Public Opinion Quarterly, and Comparative Political Studies. Covadonga Meseguer writes on international migration, the internationalization of policies, and Latin American political economy. Her work has appeared or will appear in Journal of Ethnic and Migration Studies, International Migration Review, International Studies Quarterly, World Development, European Journal of Political Research, and other journals. She is the author of Learning, Policy Making, and Market Reforms (Cambridge University Press, 2009) and coeditor of the special issue “International Migration and Home Country Politics,” Studies in Comparative International Development 49, no. 1 (2014). How does the presence of a large group of remittance recipients in the electorate affect the way political parties in Latin America plan their vote-buying operations during electoral campaigns? Existing research claims that remittances bolster the political autonomy of recipients, allowing them to escape clientelistic networks and making them less attractive targets from the point of view of party machines. Although in the long run remittances may undermine the effectiveness of clientelistic inducements, parties still have strong incentives to distribute gifts and favors among these voters. Cross-national survey evidence and an original list experiment fielded in the aftermath of El Salvador’s 2014 presidential race support the view that remittances alter key attitudes and patterns of political behavior among recipients in ways that are relevant for the electoral strategies of party machines. In particular, remittance recipients are appealing targets for clientelistic exchanges due to the uncertainty of their turnout propensity and their distributive preferences. ¿Cómo impacta la presencia de un grupo considerable en el electorado que recibe remesas en la forma en la que los partidos políticos latinoamericanos diseñan estrategias de compra de voto en períodos electorales? Los estudios sobre el tema argumentan que las remesas aumentan la autonomía política de quienes las reciben, permitiéndoles escapar de las redes clientelares y haciéndolos menos atractivos desde el punto de vista de las maquinarias partidarias. Si bien es posible que en el largo plazo las remesas socaven la efectividad de las transferencias clientelares, sostenemos que los partidos enfrentan fuertes incentivos para continuar distribuyendo regalos y favores entre estos votantes. Utilizamos encuestas de opinión pública de corte transversal y un experimento de lista llevado a cabo luego de la elección presidencial del 2014 en El Salvador para mostrar que las remesas alteran posturas y comportamientos políticos relevantes para las estrategias de distribución de los partidos políticos. Específicamente, los receptores de remesas son blancos atractivos para intercambios clientelares debido a la incertidumbre sobre su propensión a participar en elecciones y a sus preferencias distributivas. During the past three decades, political violence and economic crises have pushed millions of Latin Americans to migrate northward in search of a better future. As their economic prospects improve, migrants help those left behind by regularly sending money to their relatives. International remittances to developing countries are estimated to have reached $441 billion in 2015 (World Bank 2016), surpassing development aid and portfolio equity flows as sources of foreign income. Latin America as a region is the second-largest recipient of financial remittances in the world (World Bank 2014). The Central American countries of Honduras, Nicaragua, and El Salvador receive remittances that amount to more than 15 percent of their GDPs (Maldonado and Hayem 2013). Scholars are beginning to study the profound political implications of these incoming monetary flows. This article explores one aspect of the phenomenon, namely how the presence of remittance recipients in the electorate affects the campaign strategies of political parties. Across Latin America, parties increasingly try to mobilize the resources of migrant communities abroad and craft special appeals to attract remittance recipients’ vote at home (Itzigsohn and Villacrés 2008; Guarnizo, Portes, and Haller 2003; Aparicio and Meseguer 2012; Meseguer and Aparicio 2012a; Burgess 2014, 2016; Holland 2013). In what follows we specifically analyze the effect of remittance receipt on a prominent aspect of campaign portfolio allocation: parties’ decisions of who to target with particularistic goods and favors in exchange for electoral support. Somewhat counterintuitively, the findings suggest that in Latin America remittances make recipients attractive from the point of view of vote-buying machines. We argue that this is because remittances are associated with key attitudinal and behavioral parameters that parties take into account when planning clientelistic operations. A central assumption in the literature is that remittances are responsible for growing levels of economic autonomy vis-à-vis the state. In general, remittances are thought to empower recipients by making them less dependent on patronage and clientelistic largesse (Pfutze 2012, 2014). In authoritarian contexts, for example, remittances diminish the allure of the spoils distributed by dominant party machines, which tend to rely heavily on particularistic inducements to engineer support. This eventually destabilizes the roots of political control (Escribà-Folch, Meseguer, and Wright 2015). In democratic contexts, remittances foster disengagement in other ways. For instance, recent work shows that the economic security derived from remittances reduces recipients’ engagement with debates about state-led redistribution (Doyle 2015), as well as their likelihood to vote (Pérez-Armendáriz and Crow 2010; Dionne, Inman, and Montinola 2014). Although the long-term effects of remittances on the sustainability of clientelistic networks in Latin America is increasingly well documented at the local level (Meseguer and Aparicio 2012a, 2012b; Burgess 2012; Waddell 2015; Simpser et al. 2016),1 we still know little about how parties react to these changes in the preferences and behavior of remittance recipients. An extension of the “political autonomy” argument advanced by remittance scholars would suggest that recipients are bad targets for vote-buying operations. In a nutshell, remittances increase the risks associated with clientelistic investments by raising the price of recipients’ votes. These potential targets are now richer, so the marginal utility they derive from relatively inexpensive inducements is no longer enough to modify voting behavior. Parties should consequently avoid wasting scarce resources on them. But a closer look at the literature on vote buying suggests that when making targeting choices party brokers pay attention to other parameters in addition to income, namely, political preferences and turnout propensity.2 If we take this into account, expectations about the flow of clientelistic largesse to remittance recipients are rather different. First, a well-documented effect of remittances is to lower recipients’ underlying propensity to turn out to vote in elections. According to the literature on vote buying, uncertain turnout is precisely one of the factors driving targeting decisions (Nichter 2008; Gans-Morse, Mazzuca, and Nichter 2014; González-Ocantos, Kiewiet de Jonge, and Nickerson 2015). We therefore contend that far from avoiding remittance recipients, parties try to mobilize them via turnout buying in order to counter their tendency to disengage. Second, despite being relatively poor, remittance recipients are more likely to embrace center-right economic policy preferences (Doyle 2015). This puts them in the eye of right-wing politicians, who are naturally interested in cementing these preferences (Stokes 2005; Díaz-Cayeros, Estévez, and Magaloni 2016). The appeal of remittance recipients as targets during clientelistic campaigns should be higher for right-wing parties. We argue that clientelism is one of the tools they use to achieve this. After developing these propositions in greater depth, we adopt a dual empirical strategy to examine the relationship between remittance receipt and vote-buying targeting. First, we present a case study of El Salvador. If remittance recipients are indeed attractive targets for vote-buying machines, the observable implications of our argument should be most clearly traceable in a case where the remittance vote can have decisive influence in the balance of power. With over 20 percent of remittance recipients among the electorate and extremely competitive elections, El Salvador offers this type of theoretical context. In order to purge our measure of vote buying from social desirability bias (González-Ocantos et al. 2012), we use a list experiment embedded in an original representative survey conducted after the 2014 general elections. The evidence suggests that receiving remittances is the strongest predictor of being targeted with gifts and favors. In line with our alternative account, this positive relationship is explained by the fact that parties target remittance recipients who are to the right of the political spectrum but have lower turnout propensities. Most likely, the center-right party (Alianza Republicana Nacionalista, ARENA) is behind this finding following the party’s effort to mobilize ideologically friendly voters. Second, we turn to survey data on vote buying and remittances collected by the Latin American Public Opinion Project (LAPOP) in ten Latin American countries where a nonnegligible proportion of the electorate (at least 4 percent) receives remittances. The goal is to evaluate whether our main proposition holds across the region. Although the measure of vote buying used in this part of the analysis is not as valid due to social desirability bias, the results are broadly consistent with those of the case study. As in El Salvador, remittance recipients in most countries are targeted at significantly higher rates than nonrecipients. Are Remittance Recipients Good Targets for Vote Buying? The flow of remittances is often associated with rising incomes among a portion of the poor. Scholars interested in the political economy of remittances have argued more or less explicitly that this income substitution effect makes buying the votes of recipients less effective. It follows that rational party machines operating under budgetary restrictions should spend fewer campaign resources on these unreliable and more expensive voters. Several studies have shown that as a result of greater economic autonomy from the state, remittance recipients tend to disengage electorally. For example, remittance recipients in hegemonic regimes that rely heavily on clientelism abstain from voting for the incumbent because the main utility they derive from doing so—that is, the largesse provided by the regime—is now compensated by remittances (McMann 2006). The substitution effect is enhanced by the fact that remittances qua financial flows are countercyclical—increasing in bad times—thus performing an insurance function (World Bank 2006; Chami et al. 2008; Fajnzylber and López 2007). In the long run, remittances improve incomes and also allow the families that receive them to become less dependent on the state’s provision of local public goods and public welfare (Adida and Girod 2011; Duquette-Rury 2014). In this way, this income effect further debilitates clientelistic exchanges. Goodman and Hiskey’s (2008) pioneering study of the impact of out-migration during Mexico’s historic 2000 election that marked the end of the PRI’s hegemony reports lower levels of turnout in municipalities that received high volumes of remittances. Similarly, Pfutze (2012, 2014) finds that where migration levels were high, the probability of opposition victory that year increased. Remittances were therefore instrumental in causing the Mexican political transition by enabling recipients to escape the PRI’s extensive clientelistic networks. Importantly, these findings hold when looking beyond nondemocracies and Mexico. Dionne, Inman, and Montinola (2014) find that remittance recipients in twenty African countries are less likely to vote. Although most of the literature focuses on the effect of remittances on electoral and nonelectoral behavior, some authors have also looked at how incumbent parties adapt their strategies. For example, Ahmed (2012) argues that given the substitution effect of remittances, autocrats can redirect resources away from social spending toward patronage, a move that helps them prolong their tenure in office. In this context, remittances lead to more, not less, clientelism, but the underlying assumption is still that remittance recipients are not attractive targets. The argument linking remittance flows to recipients’ greater autonomy and parties’ decisions not to target them with gifts and favors is intuitively appealing. After all, for machines with limited budgets a rise in the price of certain votes should lead them to recalculate their targeting efforts. We argue, by contrast, that remittance recipients share a number of attributes that actually provide strong reasons for rational campaigns to devote clientelistic resources to them. These attributes generate incentives that offset the disincentives produced by higher incomes. The fact that in the long run clientelistic networks may become less effective as a result of the income substitution effect does not necessarily imply that in the short run brokers will refrain from courting these voters, seeking to materially alter the utility they derive from voting for a particular party. In particular, in light of the evidence suggesting that remittances are likely to trigger electoral disengagement (Goodman and Hiskey 2008; Pérez-Armendáriz and Crow 2010; Meseguer and Burgess 2014; Dionne, Inman, and Montinola 2014; but see Acevedo 2012), parties face strong pressures to mobilize this group of voters. This is especially true in highly competitive contexts where the remittance-receiving voting bloc could prove decisive. Our central claim is that to achieve this end they will adamantly target particularistic inducements at remittance recipients, in addition to using other available mobilization tactics. Indeed, the literature on vote buying shows that voters’ low propensity to turn out to vote in elections is a key parameter that features prominently in brokers’ targeting decisions (Nichter 2008; Stokes et al. 2013; González-Ocantos, Kiewiet de Jonge, and Nickerson 2015). In addition to luring voters to the polls, gifts and favors are used to shore up attendance at rallies, thus fostering closer ties with candidates and parties (Muñoz 2014; Szwarcberg 2015). The bonds forged via clientelistic exchanges (or the sheer utility derived from receiving particularistic goods) can tip disengaged voters over the threshold between voting and abstaining, with important implications for the balance of power. This proposition is in line with the literature that examines how parties engage in transnational political activities and overseas campaigning to reach out to the diaspora and their resources, and in so doing influence the political behavior of the emigrants’ friends and family back home (De la Garza and Hazan 2003; Hamilton and Chinchilla 2001; Burgess 2012). Parties use myriad tactics to achieve this, including policy initiatives such as Mexico’s 3×1 program (Meseguer and Aparicio 2012a, 2012b; Itzigsohn and Villacrés 2008; Burgess 2012, 2016; Waddell 2015). Our claim is simply that parties reinforce the impact of these efforts at the receiving end of remittance flows via targeted clientelistic inducements. Like the programmatic appeals regularly targeted at remittance recipients (Wolf 2009; Holland 2013), clientelism is designed to increase turnout propensities. In addition to being more likely to disengage electorally, remittance recipients are also more likely to position themselves on the right of the ideological spectrum, with further implications for clientelistic targeting dynamics. David Doyle (2015) convincingly argues that Latin American governments lower welfare spending over time as a result of remittances. His results show that, due to the compensation and insurance effect of remittances, recipients put less pressure on governments for welfare spending than they would in the absence of this foreign source of income. The prospect of upward social mobility associated with the reception of remittances reduces support among recipients for government taxation to finance welfare spending. Consequently, “recipients are likely to support political parties and candidates that favor less redistribution and lower taxes” (Doyle 2015, 109). Because of the rightward economic policy preferences of the average remittance recipient, the incentives to use clientelism to counter disengagement are stronger among right-wing parties. For parties on the right, nonprogrammatic strategies such as clientelistic appeals offer a way of reinforcing these conservative loyalties (cf. Díaz Cayeros, Estévez, and Magaloni 2016). The distribution of particularistic gifts and favors presents an opportunity to directly reach a large bloc of otherwise elusive low-income voters and establish credibility as effective providers of benefits (Kramon 2011). There is evidence to suggest that right-wing parties certainly perceive remittance recipients as a constituency that can be mobilized in this way, precisely because of the mechanisms identified by Doyle (2015). For example, ARENA officials interviewed by Michael Paarlberg during El Salvador’s 2014 presidential campaign believed that migrants in the United States—and by extension their families back home—“should favor ARENA more: many migrants are small business owners, whose community life centers around church activities …, which for ARENA officials mean more conservative” (Paarlberg 2015, 46). In sum, our two propositions are as follows. First, contrary to the economic autonomy thesis, we contend that parties do have strong reasons to target remittance recipients with clientelistic inducements. Specifically, they do so to counter their tendency to disengage electorally. Second, due to their rightward economic policy preferences, we contend that right-of-center remittance recipients will be actively targeted by party brokers. The appeal of this strategy is likely to be stronger among right-wing parties. For these parties, clientelism presents a viable option to buy turnout and reinforce ideological preferences. One legitimate concern with our argument has to do with the capacity of party brokers to identify remittance recipients. Remittance recipients, however, are likely to be easily identifiable by machines, facilitating the distribution effort. As argued by Carlin and Moseley (2015), brokers “employ any and all information” to optimize the effectiveness of clientelistic campaigns. Party operatives are deeply embedded in the community, and are therefore able to find out about myriad attitudes that condition the security of investments, including turnout propensity, partisanship, beliefs in ballot secrecy, reciprocity values, and perceptions of election legitimacy (Nichter 2008; Stokes et al. 2013; Gans-Morse, Mazzuca, and Nichter 2014; Lawson and Greene 2014; González-Ocantos, Kiewiet de Jonge, and Nickerson 2015). Compared to these traits, identifying who has relatives abroad or regularly receives remittances is certainly much easier. For example, our fieldwork research on the interaction between emigrants and their relatives at home reveals that these individuals are highly visible actors in their communities (Meseguer and Aparicio 2012a). In the remaining sections of the paper we examine the nature of the relationship between remittance receipt and vote-buying targeting first using a list experiment fielded in El Salvador and then with cross-national data collected by LAPOP. Electoral competition in El Salvador revolves around two main political parties with national reach, robust subnational roots, and distinct social origins. The rightist ARENA was formed in the early 1980s by sectors of the military and the landowning oligarchy, while the left-wing Frente Farabundo Martí para la Liberación Nacional (FMLN) is the successor of the groups that rose against the state during the civil war (Mainwaring and Pérez-Liñán 2013). Both parties have gradually moved away from their reactionary or extremist origins and embraced more moderate positions. In the first decade following the democratic transition, ARENA displayed an extraordinary ability to mobilize voters from different social classes. The party continued to tap voters’ memories of the conflict, emphasizing its unwavering anticommunist stance (Wolf 2009). In addition, its implementation of “iron fist” policies further increased the party’s credibility among the lower and middle classes concerned with gang violence (Holland 2013). Growing moderation among the leadership of the FMLN, however, gradually turned it into a competitive challenger (Mainwaring and Pérez-Liñán 2013). Since the 1994 peace accords the two parties have been the main contenders for the presidency, with ARENA winning on three occasions (1994, 1999, and 2004) and the FMLN on two (2009 and 2014). In this competitive context, both parties began to focus on remittance recipients, who make up nearly a quarter of the electorate, in order to shift the balance of power in their favor. Although by regional standards Salvadoran parties are more programmatic and campaigns display polarizing left-right discourse, electoral competition also involves clientelistic appeals. For example, a report submitted by the Organization of American States’s (OAS) election monitoring mission in 2009 mentions “vote-buying operations or attempts to buy votes” (OAS 2009). It is well established that ARENA has access to resources “for intimidation and social control” in the remnants of its old clientelistic networks in the coffee estates (Wood 2000b; Koivumaeki 2014). Strong support among the upper classes and wealthy business elites enabled ARENA to consistently outspend their rivals in media campaign research of the electorate and in territorial coverage. As a result, ARENA has traditionally enjoyed an advantage in the clientelistic game. According to Koivumaeki (2014), this resource asymmetry between the party and its competitors “has helped the party to form credible linkages to rural and less-educated sectors of the society” (2014, 275). These sectors are significant sources of El Salvadoran emigration. The results of a recent survey of legislators reinforce the claim that clientelism is pervasive (Martínez Rosón and Corral González 2015). In response to a question about the use of vote buying in the country, 85.2 percent responded that the distribution of goods during elections was very/somewhat frequent. When asked about their own behavior, 13.1 percent admitted to distributing goods very/somewhat frequently and 31.1 percent to providing patronage contracts very/somewhat frequently. The fact that political parties resort to a multiplicity of appeals to mobilize votes, including vote buying, is only to be expected in a country with extremely competitive elections and a progressive decline in turnout figures. For example, in the second rounds of the 2009 and 2014 presidential elections, the FMLN won by razor thin margins (2.64 percent and 0.13 percent, respectively). Moreover, since 2006 the difference in the size of the congressional delegations of the main parties has never exceeded four seats. In addition to using all resources at their disposal, when every vote counts parties must often slice and dice the electorate to obtain larger margins among relevant constituencies. In El Salvador no group of voters is more coveted than remittance recipients. As the war crippled the coffee-exporting economy and forced thousands to migrate to the United States, remittances became the main source of foreign exchange (Wood 2000a). Indeed, El Salvador ranks high in Latin America in the amount received in remittances as a percentage of GDP (16.8 percent, World Bank 2016). According to the polls conducted by LAPOP, between 2004 and 2014 an average of 23 percent of Salvadorans received remittances, making it one of the countries with the largest number of recipients in the region. Successfully targeting campaign appeals to this sizeable group can potentially make a huge electoral difference. Are remittance recipients in El Salvador central targets of vote-buying operations, or do party brokers avoid them as predicted by the autonomy argument? To explore this relationship in the aftermath of the 2014 presidential elections, we fielded an original survey that contained a list experiment.4 List experiments are used to gauge a wide variety of attitudes and behaviors thought to be subject to systematic underreporting, making them a suitable way to measure vote buying (Corstange 2009; Holbrook and Krosnick 2010; González-Ocantos, Kiewiet de Jonge, and Nickerson 2015). The potential for nonignorable bias is of particular concern in studies of the relationship between vote buying and remittances. The latter have positive effects on fostering civic values that are known to enhance social desirability pressures due to greater awareness of norms against clientelism (González-Ocantos, Kiewiet de Jonge, and Nickerson 2014; Kiewiet de Jonge 2015). Using obtrusive measures of vote buying could result in a severe underestimation of the true extent of gift dispensation among remittance recipients. Table 1 reports estimates of vote buying according to the list experiment as well as direct questions about vote buying at the individual and neighborhood levels.8 While fewer than 3 percent of respondents admitted to receiving a gift or favor when asked directly, both the list experiment and the neighborhood question indicate higher levels of vote buying. According to the list experiment, over 9 percent of respondents received a gift or favor, while nearly 22 percent indicated the distribution of gifts or favors in their neighborhood. Follow-up questions to the neighborhood item suggest that parties distributed a wide range of goods including food, clothing, and money.9 While the inefficiency of the list experiment means that we cannot be certain that the estimate exceeds the direct individual estimate, concerns about social desirability bias lead us to use the former in the remaining analysis. Vote buying during the 2014 presidential elections in El Salvador. Linearized standard errors adjusted for the survey design are in parentheses. The list experiment vote buying estimate is significant at p < 0.09 (one tailed test), while the direct estimates are significant at p < 0.01. Table 2 provides a first look at the relationship between remittance receipt and vote buying. The first column reports that 20 percent of the sample received remittances, which is roughly in line with previous studies (Fajnzylber and López 2008).10 The second column shows list experiment estimates for remittance recipients and nonrecipients. Recipients were key targets: over 35 percent of remittance recipients received a gift or favor, while only 3 percent of nonrecipients participated in a vote-buying exchange. This difference is not only substantively large, but it is also highly significant (p < 0.01). Further, the estimates suggest that of the 9.4 percent of respondents who received a gift or favor, three-quarters were remittance recipients. Remittances and vote buying in the 2014 El Salvador elections. The cell entries in the second column are based on list experiment estimates of vote buying. Linearized standard errors adjusted for the survey design are in parentheses. Multivariate analysis confirms the robustness of this bivariate result. In addition to basic individual-level demographic controls (gender, age, education, income, rural/urban residence), the analyses incorporate two variables that feature prominently in theories about the self-enforcing nature of vote-buying exchanges; that is, attitudes toward reciprocity and beliefs in ballot secrecy (Finan and Schechter 2012; Lawson and Greene 2014; Stokes 2005; González-Ocantos et al. 2012). Several models also include municipal level variables: poverty, remittance recipients per capita, and municipal emigration rates per capita.11 The analysis includes department (i.e., provincial) fixed effects rather than municipal fixed effects given the small number of respondents in most municipalities and the indirect nature of the list experiment, which requires interactions between each municipal dummy variable and treatment list assignment. Fixed effects allow us to control for unobserved, time-invariant provincial features. Following standard practice with list experiments, the models regress the number of list items indicated by respondents on assignment to the treatment list and covariates, which enter interacted with treatment assignment as well as in non-interacted form (Holbrook and Krosnick 2010). In the interest of space, since the coefficients for the interacted variables are comparable to standard regression coefficients, while the non-interacted coefficients predict responses to the control list, we only report the former. All covariates, with the exception of remittance receipt and departmental dummies (fixed effects) are mean centered. Predicting party targeting in El Salvador, baseline OLS interaction models. +p < 0.1, *p < 0.05, **p < 0.01. Cell entries are from an OLS regressions with the list experiment as the dependent variable. Linearized standard errors adjusted for the survey design in brackets. Standard errors are clustered at the departmental level. Covariates listed in the table are those interacted with treatment assignment. In the interest of space, non-interacted covariates, which predict control item counts, are not shown. A full regression table including all covariates is available from the authors. As we argued earlier, with a downward shift in turnout propensity parties could choose to target remittance recipients in order to buy participation. In addition, remittances recipients place themselves more to the right of the political spectrum. Brokers working for right-wing parties could therefore preferentially target remittance recipients in an effort to cement recipients’ preferences. To the extent that both downward shifts in turnout and center-right preferences are operative among remittance recipients, higher targeting is more likely to be due to efforts by right-wing parties like ARENA to buy the turnout of citizens with whom they have an ideological affinity but who are inconsistent voters. If the FMLN were to target these voters it would be engaging in an attempt to buy both turnout and preferences, something that the literature considers too costly and therefore highly unlikely. At the bivariate level, several of these mechanisms appear plausible. On one hand, remittance respondents are more likely to identify ideologically on the right (+10 percentage points) rather than on the center (–5) or the left (–5). On the other hand, while there is no strong relationship between past turnout and remittance receipt for the full sample, more right-leaning remittance recipients are about 5 percentage points more likely to have abstained in one or both of the previous elections. These findings suggest that greater core support for the right-wing party and lower turnout propensities among these voters help explain the strong positive relationship between vote buying and remittances. To test these mechanisms more rigorously, we ran several additional models that included political preferences and turnout propensity along with a series of interactions between these two variables and remittance receipt. Each of these models, which are reported in Table 4, also include as controls all of the variables in Model 3 in Table 3 (demographics, attitudinal variables, and department fixed effects). In the interest of space, neither the controls nor the non-interacted variables are displayed. Mechanisms linking remittance receipt to party targeting. Cell entries are from OLS regressions with the list experiment as the dependent variable. Linearized standard errors adjusted for the survey design are in brackets, including clustering of standard errors at the department level. Covariates listed in the table are those interacted with treatment assignment. In the interest of space, control variables and non-interacted covariates, which predict control item counts, are not shown. A full regression table including all covariates is available in online Appendix E.
The addition of vote propensity (M6), ideological dummies (M7), and interactions between ideology and vote propensity suggest that the strong remittance relationship is not due only to the main effect of remittance receipt on turnout likelihood or ideology. None of these variables comes close to statistical significance, and the remittance coefficient remains unchanged. Model 9, which adds an interaction between remittance receipt and turnout propensity, begins to clarify the picture. While the interaction does not quite reach conventional levels of statistical significance (p = 0.16, two-tailed), the large negative coefficient suggests that remittance recipients who are less likely to turn out were more likely to be targeted than those with perfect turnout records. Further, the addition of interactions between remittance receipt and ideological identification in Models 10, 11, and 12 shows that remittance recipients who identify with the right were substantially more likely to be targeted with gifts or favors than remittance recipients who identify with the left or center. While an examination of the regression coefficients in Table 4 points toward a focus on lower turnout of right-leaning citizens, the presence of multiple two-way and even three-way interactions makes the coefficients difficult to interpret. To clarify the findings, we estimated predicted probabilities of gift/favor receipt for different groups of voters defined by ideology, remittance receipt, and turnout propensity, holding other variables at their means, first using the estimates from Model 10. What emerges is a striking relationship between vote buying and ideology among remittance recipients. While essentially zero left-wing remittance recipients received gifts or favors,16 27 percent (se = 19 percent) of centrist remittance recipients and three quarters (76 percent, se = 21 percent) of right-wing remittance recipients participated in a vote-buying exchange. On the other hand, vote buying among nonrecipients appears only on the left and center, although large levels of uncertainty preclude strong conclusions in this respect. While other researchers have suggested theories to explain why targeting core supporters with strong turnout records for loyalty reinforcement can make strategic sense (Díaz-Cayeros, Estévez, and Magaloni 2016) or why broker incentives lead to over-targeting this group, for which clientelistic appeals are thought to be “wasted” (Stokes et al. 2013; Szwarcberg 2015), a better use of scarce resources for rational campaigns would be to purchase turnout of core supporters with inconsistent turnout propensities (Nichter 2008). Estimates derived from Model 12 confirm this expectation. According to the model, essentially all remittance recipients who identify with the right and had spotty turnout records received a gift or favor (turnout buying),17 while 42 percent (se = 23 percent) of those with strong turnout records participated in vote buying (loyalty reinforcement). Thus, among the 35 percent of remittance recipients who received gifts or favors during this highly competitive election, approximately half were low propensity voters who leaned to the right, and one quarter were high voting propensity right leaners. The remaining remittance recipients receiving gifts or favors were ideologically moderate. Although the nature of our data does not allow us to determine with certainty which parties distributed to which voters, if these results were driven by the strategies deployed by the left, it would imply the FMLN engaged in an expensive form of double persuasion. As mentioned above, this is highly unlikely. In fact, when we asked Salvadorans the question of which party engaged in the distribution of gifts in their neighborhood, ARENA beat FMLN by 20 percentage points (See Table C2 in the online appendix). This figure, together with a closer look at Salvadoran electoral politics, suggests that the findings are consistent with our argument that ARENA campaign brokers preferentially targeted remittance recipients in an effort to reinforce rightist preferences among these voters and secure their turnout. In particular, the appeals designed by the party in recent presidential races show similarly adamant attempts to mobilize the remittance vote, which as mentioned above ARENA perceived as being within its reach. For instance, ARENA’s campaigns have focused intensely on migrants and their relatives at home using propaganda to link the welfare of remittance recipients to the free-market policies championed by the party (Wiltberger 2014; Paarlberg 2015). Following the example of Mexico, ARENA used the Foreign Ministry to create United for Solidarity (Unidos), a program designed to lure Salvadoran hometown associations (HTAs) to invest in their communities of origin (Burgess 2012, 125; Wiltberger 2014). Although Unidos was short-lived, it was used by ARENA as a tool to reward politically aligned high-emigration provinces (Burgess 2012). A similar dynamic seems to be in place at the individual level. These dynamics mirror the results reported above.19 The decisive electoral influence of remittance recipients led Salvadoran parties, especially the right, to focus their campaign efforts on them. Given the attention paid to the issues that concern these voters, it is only natural that parties also deployed nonprogrammatic tactics to attract their support. The distribution of clientelistic goods was aimed at increasing turnout among remittance recipients self-located on the right, a move consistent with the qualitative evidence that brokers working on behalf of ARENA sought to both buy turnout and solidify partisan preferences among remittance recipients. Does the relationship between remittances and vote-buying targeting found in El Salvador hold up if we extend the analysis to other Latin American countries? In this section we examine two waves of surveys conducted by LAPOP in ten Latin American countries in which at least 4 percent of survey respondents said that they received remittances.20 While the less valid nature of the vote-buying measure used in the LAPOP surveys as well as the difficulty in comparing measures of political preferences and turnout preferences cross-nationally preclude convincing tests of the theoretical mechanisms examined in the case of El Salvador, the results show a robust relationship between remittance receipt and party targeting of clientelistic goods. Approximately 15 percent of Latin Americans reported being offered gifts in exchange for their vote or support either frequently or rarely. Figure 1 provides a first test of the relationship between party targeting and remittance receipt by plotting rates of vote buying among recipients and nonrecipients in the ten countries. While uncertainty due to the relatively small size of the remittance population in some of the countries somewhat blurs the picture, it is clear that remittances do not deter parties from targeting this group of voters. 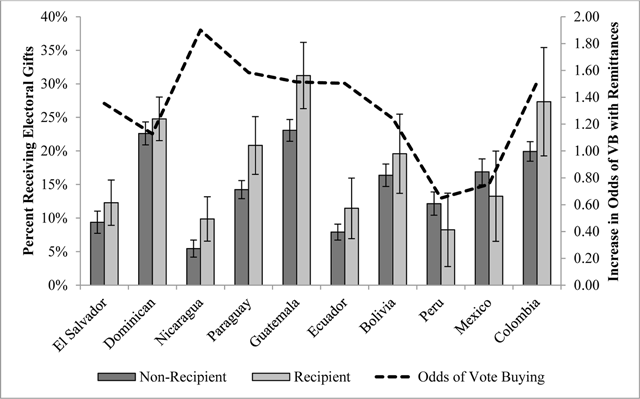 In only two countries (Peru and Mexico) is the rate of vote buying lower among recipients than nonrecipients, and neither difference is statistically significant. In the remaining eight cases targeting is higher among remittance recipients, with the gap reaching the 95 percent level of confidence in three cases (Nicaragua, Paraguay, and Guatemala) and the 90 percent level in two more (El Salvador and Colombia). On average across the ten cases, vote buying is 3 percentage points higher among remittance recipients than nonrecipients. Setting aside variation across cases, this implies an increase of 1.3 in the odds of vote buying associated with remittance receipt, ranging from a low in the case of Peru (0.6) to nearly double the rate in Nicaragua (1.9). Vote buying targeting and remittances in Latin America. Note: Percentage of citizens receiving gifts or favors by remittance receipt, along with the increase in odds of vote buying associated with being a remittance recipient. Whiskers indicate 95 percent confidence intervals. When studying the impact of remittances on political behavior, it is necessary to take into account the fact that remittance recipients may not be a random sample of the population. Certain other characteristics than the reception of remittances may drive their behavior. To tackle these selection concerns, and increase confidence in our findings, we ran a multivariate analysis employing two different methods of matching. The Coarsened Exact Matching procedure (CEM) reduces the imbalance of covariates between treated and nontreated individuals, the treatment being in this case receiving remittances. This approach matches the data on a set of pretreatment observables and generates CEM sample weights that are then used to estimate the effect of remittances on vote buying (Iacus, King, and Porro 2012). We also show the result using the Augmented Inverse Propensity Weighted estimator procedure (AIPW) (Glynn and Quinn 2010). In comparison to other matching techniques, the AIPW yields consistent average treatment effects (ATE) even if one of the equations (treatment or outcome) is misspecified but the other equation is well specified. We follow recent research when specifying the probability of the treatment (receiving remittances) as a function of gender, age, income, rural location, and education levels (Córdova and Hiskey 2015, 20). In addition, the models control for factors relevant to explaining vote buying. Since scholars have extensively debated whether machines target core or swing voters, we included a variable that measures whether respondents identify strongly with a political party (Stokes et al. 2013). The analysis also controls for income, as poverty is often regarded as the strongest predictor of vote-buying targeting (e.g., Stokes 2005; Calvo and Murillo 2004). In line with recent studies that have found a negative relationship between democratic values and the receipt of particularistic benefits during elections, we included an additional control that captures respondents’ support for democracy (Carlin and Moseley 2015). This emerging scholarship has also identified centrality in local discussion networks as a factor that increases the likelihood of being targeted by a machine, hence the inclusion of a variable indicating whether the respondent engages or not in persuading others (Schaffer and Baker 2015). Finally, the analysis explores the impact of gender, age, ideology, education, and rural location.21 All models include country and year fixed effects. Predicting party targeting in Latin America. Standard errors in brackets +p < 0.1, *p < 0.05, **p < 0.01. This article contributes to the literature on the political effects of remittances by questioning the conventional wisdom regarding the impact of such external economic flows on parties’ clientelistic strategies. While previous literature has examined this question with aggregated data, we employ individual-level survey data from Latin America and a case study of El Salvador involving a list experiment to examine the relationship between remittance receipt and party targeting of particularistic gifts and services. This strategy allowed us to explore mechanisms more directly, enhance the external and internal validity of our findings, and improve the measurement of key variables. Finally, our study also departs from previous research in that we do not focus on remittance recipients’ responses to clientelistic appeals as much as we focus on whether or not political parties regard this subset of the electorate as an attractive target for their clientelistic strategies. The evidence from the cross-national analysis and the list experiment fielded in El Salvador supports the central claim made here that remittance recipients are attractive targets for clientelistic machines. For example, of the 9 percent of respondents who participated in clientelistic exchanges in El Salvador, approximately three-quarters were remittance recipients, even though this group makes up 20 percent of the total population. We also have strong evidence that right-of-center remittance recipients are more likely to be targeted. In particular, the El Salvador data shows that remittance recipients who identify with the right, and especially rightists who have inconsistent turnout records, were the main targets of clientelistic efforts. We argued that the appeal of remittance recipients as clientelistic targets is higher for right-wing parties. Without knowledge of which parties engaged in gift dispensation it is impossible to say with certainty whether ARENA was indeed responsible for these patterns. Having said this, we believe there are good theoretical reasons and qualitative evidence to support this interpretation. Future research should explore this contention in depth. This research opens the door to multiple questions and leaves some issues unresolved. First, we did not explore the role of so-called social remittances; that is, the impact of having relatives abroad and communicating with them, in the probability of being targeted (Levitt 1998). Given the high correlation that exists between social and financial remittances, we think it is convenient to study the impact of financial remittances in isolation. Nevertheless, communication with relatives abroad, net of remittances, has been proven to correlate with some of the political behaviors mentioned above. Córdova and Hiskey (2015) recently showed that communicating with relatives based in the United States significantly increases the chances that those left behind identify with a political party, attend local political meetings, and engage in persuading others. In turn, Schaffer and Baker (2015) have shown that parties target vote-buying operations at individuals who engage in political persuasion. Thus, social remittances may lead to a higher likelihood of being targeted with gifts and favors during campaigns. Unfortunately, the El Salvadoran survey does not include a question to study the role of social remittances. Future research should design more comprehensive instruments to explore whether these immaterial cross-border flows also correlate with a greater probability of being targeted with clientelistic inducements. Second, research should expand to address the role of relevant contextual factors in targeting dynamics (Gans-Morse, Mazzuca, and Nichter 2014). For instance, in the case of El Salvador, mobilizing voters with a lower propensity to vote, including a great portion of remittance recipients, might have been particularly pressing in a context of highly contested elections and a two-party system. Mobilizing these voters may not be as necessary under other circumstances, in particular when the elections are not so competitive. In such contexts, parties could conclude that incurring additional costs to embrace the opportunity to mobilize new voters might not accrue decisive benefits. Similarly, in multiparty settings the right’s effort to court remittance recipients may be constrained by the presence of other, more centrist parties that are closer to these voters’ ideal points. Given this, although our results in other Latin American countries seem to back up our main finding, future research should seek variation in this and other features of the electoral context in order to explore the portability of our argument. Importantly, while we find that contrary to expectations the reception of remittances does not deter machines from targeting these relatively “expensive” voters, our finding is not in conflict with some research showing that remittance recipients are less likely to vote for incumbents in political systems known for resorting to clientelistic practices. In other words, the fact that the vote of remittance recipients seems to be actively sought by political parties does not imply that remittance recipients succumb to their strategies. Thus, recipients can be targeted and not accept the gifts; or they could accept the gifts and still vote with their conscience. Future research involving fieldwork should disentangle the micro-foundations of remittance recipients’ responses to the clientelistic strategies of electoral machines across democratic and nondemocratic regimes. 1However, these works have focused on collective rather than on individual remittances. 2In fact, in some studies income is not even a good predictor of targeting (González-Ocantos et al. 2012; González-Ocantos, Kiewiet de Jonge, and Nickerson 2015; Carlin and Moseley 2015). 3Our argument assumes that parties in the political system have the organizational capacity to buy votes. This is an important scope condition. To the extent that right-wing parties have significantly better machines than their left-wing counterparts do, the difference in targeting patterns should become starker. 4Poststratification weights that align the sample with the first round of election results are included in all analyses. See online Appendix B for details of the survey design. 5The survey firm, which has substantial experience in implementing survey experiments (including list experiments), was provided detailed instructions for implementation of the list experiment for use in interviewer training. There were no significant differences in the results after controlling for interviewers’ subjective assessments of the degree to which the respondent understood the survey instrument. 6Anonymity breaks down if the respondent indicates 0 items (floor effect) or the maximum number (4 or 5, ceiling effect). To avoid such effects, we followed Glynn (2013) by implementing a negative correlation design in choosing the control items. Specifically, the last item on the list indicated abstention, which is likely to be negatively correlated with the other items on the list. This design was largely successful in avoiding ceiling effects. Among treatment group respondents, only one respondent indicated all five items, and only six respondents in the control group indicated four items. While a quarter of the sample chose zero items, the potential bias from floor effects seems minimal given the nature of the control items. Further, Blair and Imai’s (2012) test of design effects suggests that we cannot reject the null of no design effect, which provides some evidence that the list experiment assumptions are met. 7Specifically, to generate estimates of vote buying, we can subtract the average number of items indicated by members of the control group from the average number indicated by treatment group members at the aggregate and subgroup levels. Multivariate analysis is also possible using OLS and fixed interactions between covariates and assignment to treatment, as well as maximum likelihood approaches (González-Ocantos et al. 2012; Blair and Imai 2012). 8Random assignment to treatment and control groups was successful in terms of balance across observed demographic and attitudinal covariates. See Table C1 in the online appendix for details. 9See online Appendix C for further details. 10To measure our key independent variable we asked each respondent about the degree to which his or her household income depends on remittances. For the analysis we dichotomized the four-point scale to distinguish those whose households do not depend on remittances at all (0) from those who depend a little to a lot on remittances (1). The results are not dependent on this scale recoding. 11Question wording and descriptive statistics are available in online Appendix A. 12The absence of significant coefficients for the other independent variables likely reflects the indirect nature of the list experiment combined with statistical inefficiency of the linear interaction estimation. While we attempted to estimate the models using the more efficient maximum likelihood approach developed by Blair and Imai (2012), such models are not robust and often have difficulty converging. In this case, the models would not converge after adding more than a couple covariates. It is important to stress, however, that the ordinary least squares fixed interaction approach reported here is inefficient (and therefore conservative) but parameter estimates remain unbiased (Imai 2011; Blair and Imai 2012). 13One other potential explanation for the lack of other significant predictors is that the remittance variable could be highly collinear with some of the control variables, soaking up variation that they otherwise might explain and further increasing standard errors. Rerunning the models without the remittance variable suggests that might be a partial explanation: perceptions of party monitoring capacities reaches significance at the 90 percent level of confidence in most of the models. However, in contrast to other studies, this would suggest that people with doubts about the secrecy of the ballot are not preferentially targeted. This finding would be consistent with greater efforts to buy turnout (e.g., González-Ocantos, Kiewiet de Jonge, and Nickerson 2015). No other variables come close to reaching statistical significance. 14Without panel data we cannot rule out endogeneity between political preferences and vote buying. We chose to use ideology rather than party identification since this receipt of gifts or favors arguably would be more likely to affect party identification than more abstract ideological preferences. Further, our argument stipulates that rightward shifts in ideology, rather than partisanship, are one of the key mechanisms by which remittances sustain high levels of party targeting. The results are similar using either ideology or partisanship. 15Although including turnout in the first round of 2014 elections in the turnout propensity variable may raise some endogeneity concerns, we argue that it provides a more fine-grained measure of turnout propensity than a simple dichotomous variable corresponding to turnout in 2009. Regardless, using this simpler version leads to similar results, with vote buying substantially higher among remittance recipients who did not turnout in 2009 than those who did. 16The specific estimate is actually –3 percent (se = 19 percent). Negative estimates can occur in these models since they are estimated using OLS rather than a probability scale. 17This estimate also slightly falls beyond the probability scale at 105.3 percent (se = 28.1 percent). 18In contrast, the FMLN’s anti-American rhetoric resonates badly with emigrants and their families back home. In the 2014 presidential election, the FLMN candidate, Vice President Salvador Sánchez Cerén, adopted an antagonistic stance, aspiring to reduce the country’s dependence on the United States. Sánchez Cerén, “a true revolutionary” and guerrilla leader with active involvement during the civil war, was more interested in courting Venezuelan petrodollars instead. During the campaign, he promised to join ALBA (Colburn and Cruz 2014, 149–150). This message could hardly be reassuring to migrant families, who see their fortunes closely tied to a predictable relationship between El Salvador and the host country. 19Also, these dynamics throw doubt on an alternative explanation for our findings, namely, that high emigration from ARENA strongholds (in other words, a rightist diaspora) drive the results. As Burgess explains (2012, 132), historically speaking, emigration is strongly associated with the civil war, and consequently refugees close to the FMLN populated the first wave of emigration. Contemporary high-emigration provinces and ARENA vote hardly overlap. For instance, in the first round of the 2014 presidential election, ARENA beat FMLN in just one department (Cabañas) but lost to the FMLN in the other eleven provinces, including some high-emigration provinces such as La Unión. Tribunal Supremo Electoral, http://www.tse.gob.sv/. 20We restricted the sample because parties’ strategies are only likely to be affected in those countries where remittance recipients constitute an electorally relevant group. The results shown below are in fact stronger when we include all Latin American countries. 21For question wording and descriptive statistics, see online Appendix A. 22Online Appendix D shows that there is a rationale to suggesting that the two mechanisms we pose (lower propensity to turn out to vote and a higher probability of identification with the right) are also observed in these Latin American countries. We are grateful to participants in the Seventy-Third Annual Meeting of the Midwest Political Science Association, 2015; participants in the Fortieth Annual Meeting of the British International Studies Association, 2015; and participants in the Fifty-Seventh Annual Meeting of the International Studies Association, 2016, for their suggestions. We are grateful to our colleagues Katrina Burgess, Abby Córdova, David Doyle, Maria Koinova, Clarisa Pérez-Armendáriz, and Gerasimos Tsourapas for their comments. Finally, we thank Jesse Acevedo for sharing his municipal data on El Salvador, and to Pascal Jaupart for excellent research assistance. Covadonga Meseguer writes on international migration, the internationalization of policies, and Latin American political economy. Her work has appeared or will appear in Journal of Ethnic and Migration Studies, International Migration Review, International Studies Quarterly, World Development, European Journal of Political Research, and other journals. She is the author of Learning, Policy Making, and Market Reforms (Cambridge University Press, 2009) and coeditor of the special issue “International Migration and Home Country Politics,” Studies in Comparative International Development 49, no. 1 (2014). Covadonga is currently Associate Professor in International Political Economy at the London School of Economics and Political Science. Acevedo, Jesse. 2012. “Migration, Remittances, and Politics in Postwar El Salvador.” Paper prepared for the Annual Meeting of the American Political Science Association, New Orleans. Chami, Ralph, Adolfo Barajas, Thomas Cosimano, Connel Fullenkamp, Michael Gapen, and Peter Montial. 2008. The Macroeconomic Consequences of Remittances. Occasional Paper 259. Washington, DC: International Monetary Fund. De la Garza, Rodolfo, and Myriam Hazan. 2003. Looking Backward, Moving Forward: Mexican Organizations in the U.S. as Agents of Incorporation and Dissociation. Claremont: Tomás Rivera Policy. Dionne, Kim Yi, Kris L. Inman, and Gabriella R. Montinola. 2014. “Another Resource Curse? The Impact of Remittances on Political Participation.” Afrobarometer Working Paper No. 145. Hamilton, Nora, and Norma Stoltz Chinchilla. 2001. Seeking Community in a Global City: Guatemalans and El Salvadorans in Los Angeles. Philadelphia: Temple University Press. Koivumaeki, Riitta-Ilona. 2014. “El Salvador: Societal Cleavages, Strategic Elites, and the Success of the Right.” In The Resilience of the Latin American Right, edited by Juan Pablo Luna and Critóbal Rovira Kaltwasser, 268–293. Baltimore: Johns Hopkins University Press. Kramon, Eric. 2011. “Why Do Politicians Buy Votes When the Ballot Is Secret? Theory and Experimental Evidence from Kenya.” Unpublished manuscript. Available online at: http://cega.berkeley.edu/assets/cega_events/47/21_Kramon.pdf. Mainwaring, Scott, and Aníbal Pérez-Liñán. 2013. Democracies and Dictatorships in Latin America: Emergence, Survival and Fall. New York: Cambridge University Press. Maldonado, René, and María Luisa Hayem. 2013. Remittances to Latin America and the Caribbean in 2012: Differing Behavior across Subregions. Washington, DC: Multilateral Investment Fund, Inter-American Development Bank. Martínez Rosón, Mar, and Margarita Corral González. 2015. “Clientelismo en Guatemala y El Salvador: ¿Condicionan los distritos el comportamiento clientelar?” Revista Latinoamericana de Política Comparada 9: 35–52. McMann, Kelly. 2006. Economic Autonomy and Democracy: Hybrid Regimes in Russia and Kyrgyzstan. Cambridge: Cambridge University Press. Meseguer, Covadonga, and Javier Aparicio. 2012a. “Supply or Demand? Migration and Political Manipulation in Mexico.” Studies in Comparative International Development 47(4): 411–440. Meseguer, Covadonga, and Javier Aparicio. 2012b. “Migration and Distributive Politics: The Political Economy of Mexico’s 3×1 Program.” Latin American Politics and Society 54(4): 147–178. Montesino, Mario. 2004. “Economía remesera y proceso electoral.” Revista de Extensión de la Universidad Centroamericana José Simón Cañas 59: 291–312. OAS (Organization of American States). 2009. Informe de la misión de observación electoral elecciones de diputados al parlamento centroamericano, asamblea legislativa y consejos municipales del 18 de enero de 2009 en la república de El Salvador. Organización de Estados Americanos, CP/doc. 4452/09, December 7, 2009. Paarlberg, Michael. 2015. “Party Motivations for Diaspora Campaigning: A Case Study of El Salvador.” Unpublished manuscript, Georgetown University. Peraza, Xiomara. 2008. “Migrant-Local Government Relationships in Sending Communities: The Power of Politics in Postwar El Salvador.” Migraciones Internacionales 4(3): 105–130. Wood, Elizabeth. 2000a. Forging Democracy from Below: Insurgent Transitions in South Africa and El Salvador. New York: Cambridge University Press. Wood, Elizabeth. 2000b. “Civil War and the Transformation of Elite Representation in El Salvador.” In Conservative Parties, the Right, and Democracy in Latin America, edited by Kevin Middlebrook, 223–254. Baltimore: Johns Hopkins University Press. World Bank. 2006. Global Economic Prospects 2006: Economic Implications of Remittances and Migration. Washington, DC: World Bank. World Bank. 2014. Migration and Remittances: Recent Developments and Outlook. Migration and Development Brief no. 23. Washington, DC: World Bank. World Bank. 2016. Remittances and Migration Factbook 2016. Washington, DC: World Bank.